When I was 17, I was asked to teach the 5th grade boys’ Sunday School class. I was handed a lesson manual but got no instruction. I’m not sure what happened to the last teacher but, after a week or two, I suspected either a nervous breakdown or the boys had killed him off. I tried everything to gain control but it was a battle every week. That continued even when I taught Junior Church while in Bible school. “Okay Billy, take your chair and sit in the hallway.” Billy was once again disturbing the class. He just had no respect, and he was a deacon’s son! That was a mistake, because the door to the hall was behind me and it had a window in it. Billy continued to mock me through the glass, to the delight of the other students. Next time I put him in the back of the class. Thankfully I have learned by my many mistakes, and I can now teach classes of 100 or a camp chapel of 250 without much of a struggle. Let me briefly share with you some ideas that work for me. 1 – BE THEIR FRIEND, but not their “buddy.” I’ve heard people say that they want to be the “cool parent” with their kids, but you usually fail as a parent by trying to be like them. In a class YOU are the TEACHER and it is your class. If you don’t expect and exhibit authority, they will run all over you. This does not mean yelling at your class. I’ve seen bus workers scream at kids and it just goes in one ear and out the other. If you are yelling, you are not in control. It does mean having a simple set of rules and enforcing them. Kids need to know from day one that you are fair, but firm. You mean what you say and you are in charge. It will give them a sense of security if you do so. I have seen many teachers just talk over their students and continue “teaching” when the kids aren’t listening. As Barney Fife would say, “Nip it in the bud.” Establish the rules and make sure you enforce them. You can address the culprit from the front, speak to them quietly face to face, give them the “look,” or move their seat but, by all means, don’t ignore it. It won’t go away. I use incentives to gain control. I give the boys 500 points and the girls 500 points. I take points away during the bus ride or class for misbehavior. This is a form of good “peer pressure” because the points are added to the points given to the review game at the end of class. Teams have lost because of one chatty kid. Quiet seats work, too, especially on the bus, but I use them sparingly. Give kids a reason to listen with incentives and by being prepared. 2 – BE PREPARED. I try to move from singing to the lesson to game time without any break in the action. It only takes a few seconds for kids to get rowdy and then you have to rope them in. I will have the kids countdown from 15 while I change from my PowerPoint lesson to the game. It keeps them busy as they try to “beat me” in the transition. Sadly, I have seen teachers opening their lesson book for the first time the morning of class. They are missing out on many riches that come to those who truly teach. I learn more as a teacher than my students do, because I invest the time in preparation. Kids will know if you aren’t prepared and you are sending the message that your lesson isn’t really that important. If you aren’t excited about the lesson, why should they be? My wife is an outstanding teacher because she seeks as many sources as she can in preparing her lessons. You will grow in your walk with the Lord and be a far better teacher if you prepare. Failure to prepare is preparing to fail. Being prepared will solve most of your discipline problems. 3 –BE CREATIVE. I use PowerPoint for most of my lessons because my classes are big and PP is really a great tool. I can change or add a slide as the kids are coming in, if God has given me an additional idea. It is IMPERATIVE that you use visuals. We live in a very visual society and even the best storyteller benefits greatly from visuals. Visuals capture your students’ attention and help them to understand and remember the lesson. Studies have shown that kids remember 10% of what they hear but 50% of what they hear and SEE. You don’t have to use PowerPoint. Try flash cards or objects, even flannelgraph. I still remember the flannelgraph scene of Jesus’ resurrection when I was in 5th grade – that was nearly 50 years ago. Good teachers try to use all of the senses – touch, taste, feel, hearing and sight so that the students actually experience the lesson. This will take time and imagination on your part but it will pay off. Whatever you choose, use the best that you can. It is also very beneficial to have a review game at the end of class. Kids will listen so they can get points or candy during the game. It also “repeats” the lesson through questions and it will show you if they have learned what you’ve taught or not. Kids LOVE review games. 4 – BE LOVING. “People don’t care how much you know, until they know how much you care.” Paul made the importance and preeminence of love clearly known in 1 Corinthians 13. You can’t fake this with kids. They have love “radars” that point out a phony in a second, but they are drawn, like bees to honey, to someone who genuinely cares about them. Do you love your students? I can honestly say that God has given me that love but it is frustrating, because I am limited in so many ways and I have so many students. This then becomes my goal: Introduce them to Jesus, the One Who can help them all through life. I need to speak of and demonstrate just how much Jesus loves me and them. May God bless you in your teaching. We have been given the opportunity and responsibility to share God’s Word with this current generation. Let’s do our best for the Master. It is a sin to bore a kid with the Bible. 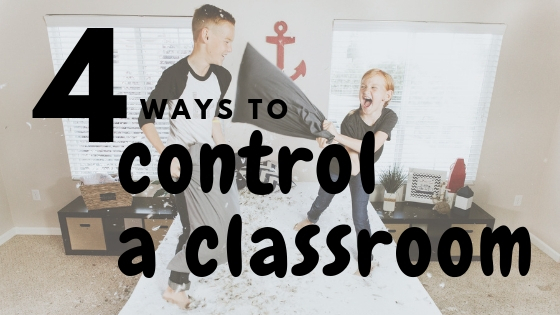 1 Reply to "4 Ways to Control a Classroom"
This is great! ESPECIALLY because it is one of our own! And I really know the author. Dr. Mark can you send this to me that I can share it with our after school club teachers. Thanks.